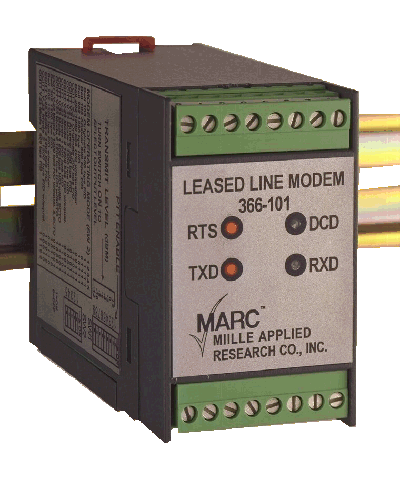 The MARC™Model 366-101 is a leased line modem that mounts on a standard DIN-rail and provides data communications with other Bell and CCITT compatible modems at speeds up to 1800 baud. This modem provides convenient terminal compression screw hook-up and clearly marked, easily accessible switches for quick and accurate operating mode configuration. Flexible and low power requirements, compact size and DIN-rail mounting make the Model 366-101 ideal for providing long distance data communication capability for PLC's and other intelligent devices. The modem operating mode and transmit signal levels are easily switch selectable by the user. A PC or terminal is not required to configure the modem. Modem operation is fully automatic requiring no external inputs or setup messages for operation. Configuration is automatic when power is first applied, based on the option switch selections.